I create my work while working with what nature presents to me, using rare exotic wood or stone and I also cast my work in bronze. This piece is made from rare curly Koa wood. Only 10% of Koa wood is "curly" and with the wood being endangered, one must get permission for these fallen pieces of gems that make glowing sculpture. AOM presents itself as an invaluable resource for professional artists. With artists daily studio time, we rarely have time to look for opportunities to present our work to the public and are thankful to be able to use this great resource. 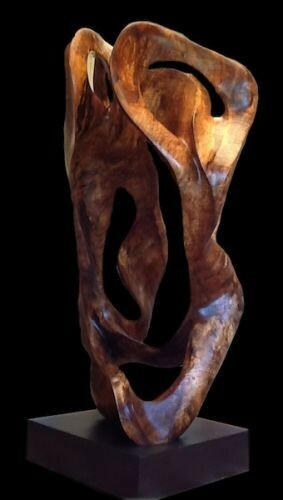 Angel Dance, 2013, Koa wood, 64 x 32 x 32 in.